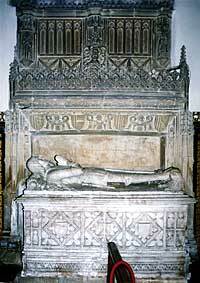 Monument to John de Strelley who died in 1501 (A Nicholson, 2003). The stone bears the Strelley shield at the top, and the star devices appear on his armour. At the west end of the altar tomb is the fine brass of Sir R. Strelley, son of Sir Robert and his wife Isabel, sister of John Kemp, Cardinal Archbishop of Canterbury. She died at Oxton, 7th September, 1458. He died 17th January, 1487.There is, in addition to the figure of the knight and lady, a helmet and mantling, with the bottom of his crest (the top of the crest is gone), also one star out of 18 originally; this ornament is probably a play on the family name (“Stella—a star) and appears on three of the tombs of the family. There are also matrices for the plates representing the children of the family. The knight is bare-headed, clad in armour; the lady wears a butterfly head dress, extended by skewers thrust into a plaited fillet; she has two dogs—one smooth-coated, one shaggy—at her feet. It is thought by some that this slab, with its brasses, originally rested on the base of the tomb in the middle of the chancel, which now has the figures of Sir Sampson and his lady upon it, and that these figures were brought from some other part of the church, but there is little, if any, authority for this supposition. 1. John’s father Strelley impaling Kemp. 2. John’s own Strelley impaling Willoughby. 4. John’s grandfather Strelley impaling Stanhope. Sir Robert Strelley (d. 1487) and Lady Isabel Strelley (d. 1458). On the right side in the moulding, there is an S formed by a serpent and stars; on the left, roses and stars (stella, as before mentioned). The figure of John rests on his crest; he has long flowing hair, his feet rest on a lion, each supported by a “weeper” sitting on the lion’s back, holding rosaries in their left hands. Parts of the figures still show traces of painting on the armour and the lady’s girdle. The inscription is in beautiful character; the place of the lady’s death is blank. She died in 1500, her husband in 1501. At the west end of this tomb is a small incised slab with the figures of two children surrounded by the following inscription:—“ Hic jacent corpora Sanciae et Jacobi gemini e fil Job’s Strelley Armig et Sanciae uxoris ejus qui quidem gemini ob. decimo septimo die Febr Anno Dni - - “ These are the twin children of John Strelley, James, his only son, and Sancia. His younger brother, Sir Nicholas, succeeded to the manor of Strelley; all the rest of his vast estates passed to his four daughters. There is still another alabaster slab at the north-east of the altar tomb. It is impossible to decipher the inscription. Some have thought by the style of the lettering that it is that of Sir Nicholas Strelley, nephew of John, who died at Strelley 1560. Choir Stalls.—Some of these are original and have no new work, others have been slightly repaired. The stalls on the north have “ Miserere” seats, two of them elaborately carved. Glass.—In one of the windows of the north aisle are some fragments of good old glass. The saint at the top of the left light was probably removed from the window over the tomb in the chancel; several of the pieces are of 13th and 14th century work. The shields on the left are those of Strelley, and Strelley impaling Willoughby; that on the left is a Warwick-shire coat of arms, said to be Lucy. Above the tomb, in the chancel, hangs a panel of old glass; perhaps the best is a deep red rose-shaped piece. In the south clerestory windows are three shields: the arms of John Strelley’s wife and her two daughters—Isobel, wife of Clement Low, and Margaret, wife of John Powtrell. In the east window of south choir aisle are several panels of English and Dutch glass, some old and good, others modern and bad.